I have been on an ink kick to start 2014, adding 6 or 8 bottles to my collection already. Some are of the basic variety, like Pilot Black, while others I went to great lengths for. Sailor Jentle Limited Edition Autumn 2010 Oku Yama Maroon is one of those. I don't know where I caught this limited edition bug from. It may be I realized a few weeks ago that I missed out on the Rohrer & Klingner Blau Schwarz in 2012 (and thanks to kind listeners I now have some), or maybe I'm just certifiable. Regardless, I went on the hunt to see what else I have missed and what else I could get my hands on. I know Sailor produces special colors frequently so I set my sights there, which led me to Aesthetic Bay, a highly respected pen shop in Singapore. 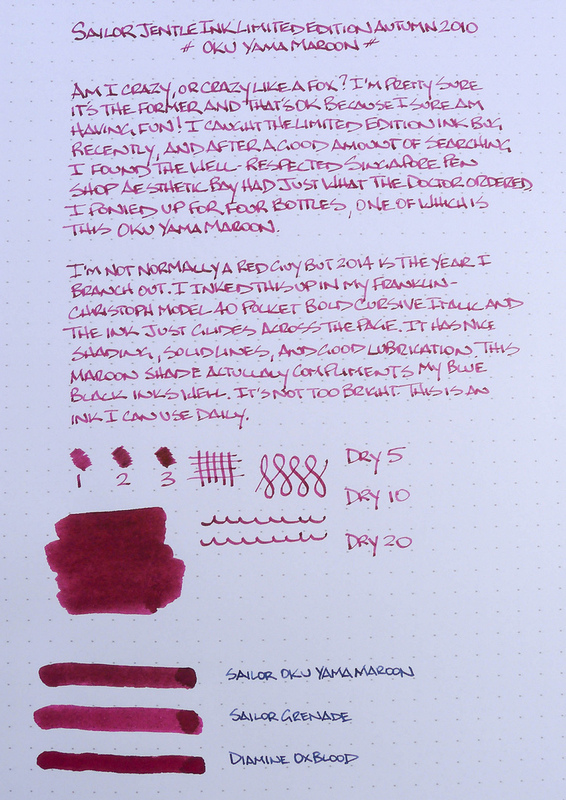 I picked up four (I know, certifiable) Sailor LE inks, the first of which is this Autumn 2010 Oku Yama Maroon. I've never been a red ink guy but the few reviews I found of Oku Yama were positive. I wasn't sure what to expect when I inked it up in my recently acquired Franklin-Christoph Model 40 Pocket Fire and Ice with a broad Masuyama cursive italic nib but I have to say it exceed all expectations. First off, the color is great. It is a solid maroon, not too bright and not to purple. I like purple on its own, but not in my red inks. The shading is better than expected too, with excellent color range in the lines. Secondly, it is a very lubricated ink, at least that's how it felt with this nib combo. I think it would work well in some of my EF nibs too. Something interesting about Oku Yama caught me off guard, and that is the dry time. When I did the five-second smear test there was no smearing. Did I forget how to count to five all of a sudden? Nope, this is legit, and on Rhodia paper it is impressive. It was a pointless exercise to even bother with the 10 and 20 second tests. How close is Oku Yama to the less expensive and widely available Sailor Jentle Grenade? I haven't reviewed Grenade yet but did have an ink sample to swab. It is lighter with more pink at first glance but I will need to do more testing. Compared to Diamine Oxblood, Oku Yama is less saturated and lighter in color. It falls right in between these two popular red inks. You can see more comparisons in the reviews below. The real measure of an ink for me is will it make my regular rotation and I think I will be loading up Sailor Jentle Oku Yama often. Posted on February 3, 2014 by Brad Dowdy and filed under Ink Reviews, Sailor.